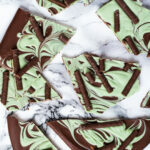 Mint Chocolate Bark – A deliciously minty white chocolate layer swirled into a thick layer of melted dark chocolate. Perfect for an indulgent treat, or gift-giving! 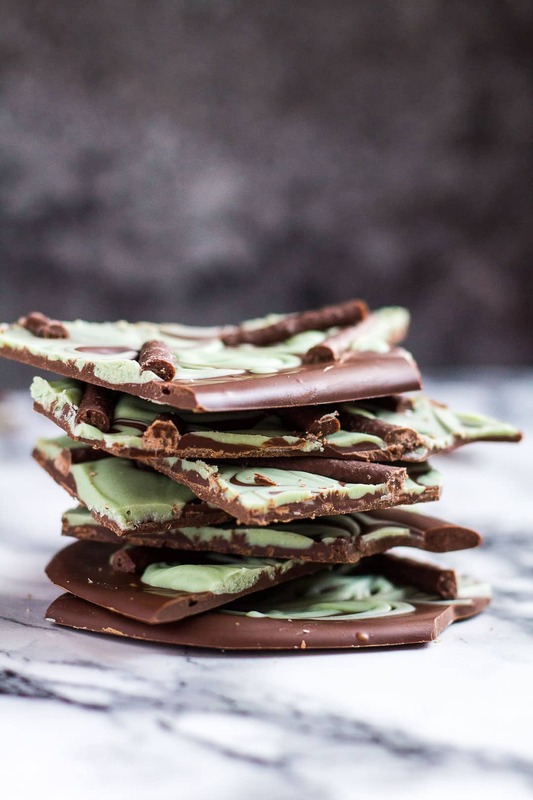 I have the perfect NO-BAKE treat for you today, that will only take 10 minutes of your time to make – Mint Chocolate Bark! This Mint Chocolate Bark only requires 4 ingredients, and is so simple to throw together. Top with your favourite mint chocolate candy for extra minty-refreshing deliciousness. It makes the most indulgent quick treat, or will be perfect for gift-giving this Christmas! 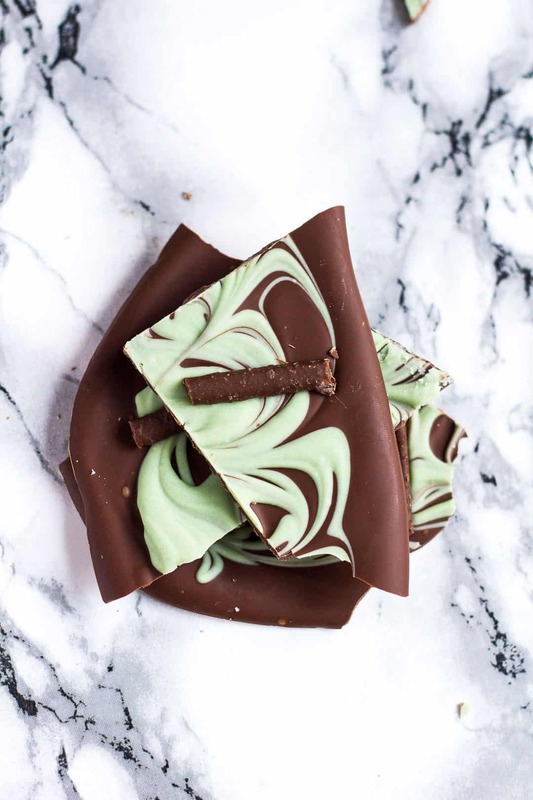 To make this minty bark, simply add the white chocolate to a microwave-safe bowl, and heat in 20 second intervals, stirring after each one, until melted and smooth. Stir in the peppermint extract, and food colouring, then set aside. Melt the dark chocolate in the same way you melted the white chocolate. Pour onto a large baking tray lined with parchment paper, and spread out into a large rectangle. Drizzle dollops of the mint white chocolate on top (use a much or as little as you want of the mixture), and use a toothpick to swirl the two mixtures together. Top with your favourite mint chocolate candy, then allow the chocolate to set at room temperature, or in the fridge. Once set, break into pieces. Because this recipe only calls for 4 ingredients, and most of that is chocolate, I highly suggest using good quality chocolate that you enjoy eating on its own. If desired, you can skip the green food colouring, but I think it makes this bark look extra minty, and so festive! Try these mint chocolate recipes next! A deliciously minty white chocolate layer swirled into a thick layer of melted dark chocolate. Perfect for an indulgent treat, or gift-giving! Line a large baking tray with parchment paper, and set aside. Add the white chocolate to a microwave-safe bowl, and heat in 20 second intervals, stirring after each one, until melted and smooth. Stir in the peppermint extract, and food colouring. Set aside. Melt the dark chocolate in the same way you melted the white chocolate. Pour onto the prepared baking tray, and spread out into a large rectangle. Drizzle lines of the mint white chocolate on top (use a much or as little as you want of the mixture), and use a toothpick to swirl the two mixtures together. Sprinkle on your favourite mint chocolate candy (I used Quality Street's Mint Matchmakers). Allow the chocolate to set at room temperature, or in the fridge. Once set, break into pieces, and enjoy! Bark can be stored in an airtight container at room temperature or in the fridge for up to 3 weeks. It also freezes well for up to 2 months. Thaw overnight in the fridge before serving. Yum! Mint & chocolate is the best! We are huge fans of mint and chocolate in our household! 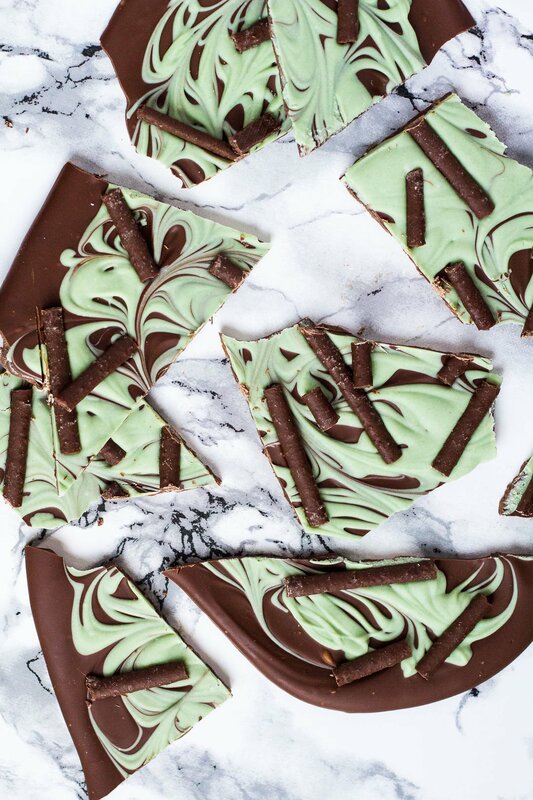 This has us craving mint chocolate bark!